The modern production process requires faster and more accurate quality control technologies to improve the overall quality and ensure optimized production parameters. Qualitest’s On-line non-contact and non-destructive X-ray measurement and control system improves the quality of your products by providing real-time feedback of absolute or deviation from target thickness measurements. 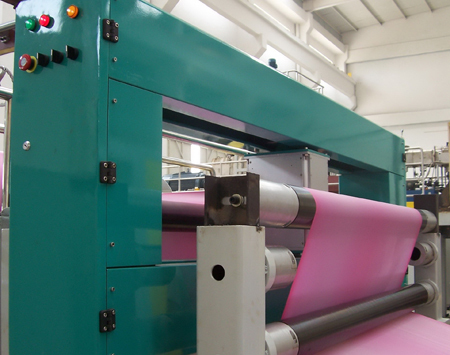 The benefit of high speed measurement and vital statistical data is optimized production control; which leads to cost reduction and productivity increase for plastic sheet, film, foil or plastic coating production lines. Qualitest On-line Film Thickness measurement systems are offered in three different standard precision ranges and are available in both O-Attenuation Calculation shaped and C-shaped frames. The standard effective scanning width is 59 inches (1500mm). Qualitest also offers customized solutions to meet most production requirements. The measuring principle of the Online X-ray thickness gauge is based on X-Ray attenuation. When the X-ray travels through the material, it will attenuate due to absorption. The material thickness is determined by the change in X-ray intensity as the ray passes through the measured material. The X-Ray source has a variable energy output from 4-10 kV, the low output energy makes the unit safe to operate. When the power supply is switched off the out put of X-Ray energy immediately stops. The X-ray source is housed in an oil filled stainless steel container which provides excellent protection. By adjusting the parameters of the X-Ray tube a wide range of material thickness can be measured. The X-Ray detector is the most critical component of the thickness gauge; our detectors are manufactured in-house under the strictest quality control to ensure stability and minimal temperature drift. The signal process module is designed with a thermostat to ensure stable signal output in all temperature conditions.